A 747-400 Cargo Jet landing on a 7,700 foot long runway? Seriously. I have no idea why they did not use the 10,500 foot one. A 747-400 Cargo Jet landing on a 7,700 foot long runway? That's not really a problem. However, given the weather conditions of the ill-fated day, I also think they should have landed in the long one. Looks like a fairly large drop off at the end of the runway. If this runway had a standard, flat 1,000' overrun (paved or turf) perhaps it would not have resulted in a write off. These incidents actually lea to YOW becoming the first airport in Canada to groove their main runways. Another ungrooved runway, another over run in Canada during rain. I'm not suggesting the lack of grooving is responsible for this, but every accident is a chain of links. The lack of grooving will be looked at and wouldn't surprise me if it found to be one of those links, in addition to more obvious items such as tailwinds, short runway, possible pilot fatigue resulting in poor judgement, etc etc. YHZ has had a number of incidents in recent years. Overshoots, undershoots and miscalculated T/Os etc. Not uncommon at all, try Melbourne's 09/27 for example. Even A380 landed on a 7500ft long wet runway the day before without issue. This has me thinking. This is very likely the third hull loss - crash? - at YHZ since 2004. The other are MK 1602 in 2004 (that's two 747s!) and AC 624 in 2015. During that same period, I can think of only 1 accident resulting in a hull loss at all of the other top-20 airports (AF 368 in 2005, at YYZ), and only 2 others in the entire rest of the country (I'm thinking of aircraft that are large enough to seat 30 passengers or more - these are the ATR at Fond Du Lac in 2017, and First Air at YRB in 2011). And let's not get into the question of how many airports there are in the US with 86,000 movements or more, which have had no crashes. Now I may be missing some incidents, but however you look at it 3 hull loss accidents is a major "outlier" in this era of safe flight, where major incidents are rare. Which leads to me to wonder: what is it about YHZ? Is it the weather conditions (I've had many bumpy approaches and landings there)? Is it the composition of the traffic (ie, fewer flights, but more large / cargo flights)? Or is it just plain bad luck? Indeed, although you can argue AC624 is pilot error (not sure about this one). When I saw this title I thought "uh YHZ again?" To be honest, if the landing is done correctly, there should not have been a problem. All you really need to do is make sure you touchdown at the appropriate point, use of autobrakes at med and full reverse. The 747 is a great aircraft for stopping. I have gone into DUB at MLW with a wet runway and used 25 flaps, auto throttles and med autobrakes and never even came close to the end. Looks like a Korean Air Cargo 777F is coming to pick up the fish . I photographed this plane earlier this year at MIA and I had to go onboard this aircraft in the days it was SQ 9V-SFF to photograph the aircraft hold after a loader's finger was lost in an incident onboard, so I feel a bit of a strange attachment to the aeroplane. A Sad end to a 747, but the aircraft's design saved the 4 people onboard by staying largely intact. I think from the photos we've seen - we can say it is comprehensively wrecked. Hope the crew aren't feeling too sore. Not sure if it was a factor but the CAT II ILS for runway 23 has been unserviceable for quite some time now. Glad the crew were ok for the most part. YHZ is always a challenge, with it's less than favourable visibility, often strong rain and tricky winds. Was that a landing with a tailwind on an ungrooved runway? I'm guessing you wisely didn't land with a (what was it 16 knot?) tailwind in that particular situation? KE Cargo have been sending a weekly freighter for fish (or lobster) to YHZ for (I think) about the past 3 years...might be even longer than that. At the time of the accident, the ILS on 23 was inop and the runway shortened by 1400'. 14 was the only ILS at YHZ that night. Now that 14/32 is closed there are no precision approaches into YHZ. Weather in the Maritimes in the winter months can be tricky at best. There should be an ILS on every runway. However ... those smarter than us have felt that terminal improvements like more stores, a waterfall, hell even a canoe in the lobby is more important than proper approach facilities. Thanks longhauler for chiming in with your expertise. Always nice to hear your insight. 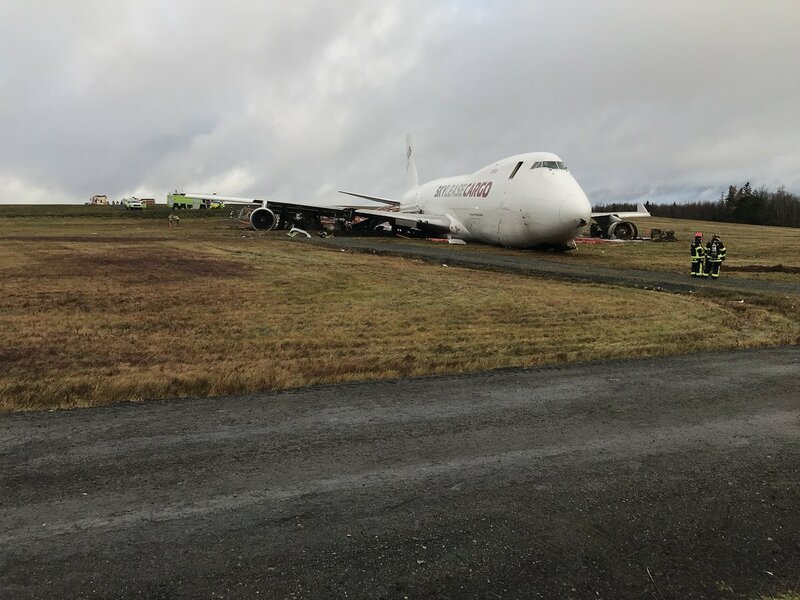 Given the weather circumstances/conditions and runway options early yesterday morning, would it have not been way more prudent to divert in a situation like this...even if the outcome were different? Also regarding having every runway equipped with an ILS, can an airport authority spend their own dollars on an ILS or are they at the mercy of Nav Canada decision making? Yes, you are absolutely correct. The coffer to improve terminal facilites is different than the (much smaller) one to improve nav aids. How ironic. Halifax has always been a irritant to me in the 35+ years I have been flying jet transport airplanes into there. The weather can be hellish but the facilities are marginal. I look at the NOTAMs now for YHZ and I shudder .... manually selected non precision NDB or GNSS approaches onto 23 or GNSS approaches onto 05. Hell, just about every airport in the US has better approach facilites. (The local flying club a few miles from here has better facilities). At least with similar construction on YVR 26R, the GNSS VNAV/LNAV approach was adjusted for the displaced threshold, thus could be performed. Not so at YHZ. With regard to diverting, one would have to be in the cockpit to understand the decisions made. Where I fly, that approach would not be allowed. More than once in the last three decades I have said to Flight Dispatch. Nope, Mrs. Longhauler's little boy aint flying into YHZ tonight! I figured you'd say something along those lines. I'd imagine the the airside investment side of things probably has something to do with few, if any airport authority CEOs being actual pilots themselves and not seeing the 'value' in investing in that. On a separate note, has grooving YOW's runways helped with safety at that airport in your opinion? Should other Canadian airports follow their lead? I'm guessing you wisely didn't land with a (what was it 16 knot?) tailwind in that particular situation?. I might be dumb, but I'm not stupid! Landing with a 16kt tailwind doesn't make much sense at all. If you think you can land with a 16kt tailwind why not land with a 16kt headwind??? I thought it was a 16kt crosswind, with a 20 degree tailwind component. That's a lot different and better than a 16kt tailwind. Did I miss something? My understanding is that the ILS on 05/23 are not working while they are constructing Runway End Safety Areas. Having RESA's on 14/32 probably would have helped this flight. But they were not due to be built until next year. Longerhauler: You said that the facilities are marginal. I don't know much about navigational aids. Once the ILS is fixed for 05/23 and whatever was broken in this incident is repaired what is missing in YHZ? What would make the approach better? I know our weather can be pretty terrible, but are there missing nav aids that should be in YHZ? Looking at the charts for CYHZ, surely it’s time to start looking at introducing RNAV LPV more widely into commercial aircraft? If you had an aircraft that can fly those minimums then situations like shooting an approach with a rather high tailwind component in relatively poor weather could become a thing os the past! In the short(er) term, having only one functional ILS at Halifax needs to change. If it’s a relatively popular airport then you don’t want some poor (but not impossible) weather effectively closing it because the runways don’t quite work! There are also 5 photos available for viewing. So how would an empty plane affect braking on a wet runway? Less mass would mean less force required to decelerate, but would it also mean that the bird is more likely to hydroplane? YHZ is my home airport, and I’ve always found it odd that all four runways aren’t equipped with ILS given the potential for our weather to be really crappy. Fog can be an issue year round never mind some of the nasty storms that can work their way up the Atlantic during all four seasons. Our weather isn’t YYT bad, but we sure have our moments. Before RNAV approaches were a thing the best approach 05 had was a backcourse approach and I don’t think 32 had anything at all other than maybe an NDB approach? I’m sure 14 and 23 were chosen for ILS based on most common prevailing winds, but it to a casual observer like me it does seem like we get a lot of northerly winds, particularly during the winter, which would press 05 or 32 into service...I wonder if there’s easily accessible data on that somewhere? Appreciate your insights as usual Longhauler. The lateral and vertical navigation methods in use were a contributing factor. In my opinion, enhanced on-board facilities like you suggest would be the future of IFR approaches. But today ... in 2018 ... the ONLY low visibility approaches like CAT 3 (RVR 600/600 in Canada) CAT 2 (RVR 1200/600) and Low Viz CAT 1 (RVR 1800) all require an ILS. (Wonder why, huh?) Maybe someday we will be doing autolands off of a GPS based approach, but we are not there yet. And ... for low viz approaches, an autoland is required. So like the gentleman above from Halifax notes, your thought in my opinion is correct. Why isn't there an ILS on all four runways in this weather tricky airport? The answer likely is money. While investing in shopping malls in airports generates revenue, does better IFR approach facilites? And Nav Canada likely doesn't want to make the investment in ILS ground facilites. It is interesting to note that this accident likely would not have happened had they been doing an ILS on 32. Nor would the A320 accident of Air Canada two years ago would have happened had they been doing an ILS on 05. I had the same thought. It will be interesting to see what the TSB has to say about this when the report for this eventually comes out (along with the AC A320 final report). Agreed on all counts longhauler. Flew into YHZ for years from another place with crappy weather (and 4 ILSs). Never liked the backcourse for 05. Amazing really that YHZ does not have ILS to every runway. Any idea as to what kind of cargo she would have been picking up and what the next destination was? The TSB report mentioned the aircraft was empty. Saw this morning, pretty scary incident. Glad the 4 crew members are ok! Not too sure the aircraft will see another day though. Nippon Air Cargo has just sent three "young" B744F to storage (LN 1394, 1397 and 1408). Guess Skylease Cargo can pick up some to replace N908AR. There comes a point though when airlines will start saying “no” because yet again their packed flight from X has to be diverted due to weather. At that point the authorities will start to listen! I think LPV down to CAT 2/3 is a way off yet, however there are approaches out there right now with the exact same DA as the ILS on that runway. For the majority of situations that will be fine, as unless it’s a coastal airport or one like EMA (which is CAT3 at both ends anyway IIRC) that regularly experiences early morning autumnal fog, 200’ above will be more than adequate with the addition of a GBAS transmitter. In Poland (where I am right now), GPS approaches are quite common as often there is ILS at only one end of the single runway. Looks so much smaller sitting on the ground surprisingly. Glad everyone made it out alive though! I'm not an expert, but the sheer force of the plane in a totally empty condition might indeed have led to hydroplaning. This is surely not the sole reason, it might have contributed to the chain of wrong decisions, unlucky circumstances, etc. @longhauler: again, I'm not an expert; what is actually required to have an ILS installed and fully set up? If memory serves me correctly 747 was 10 kts? Very true about both accidents. I wondering if legal action could be taken an airport or Nav Canada for failing to provide inadequate airside (i.e., runway) facilities? I wonder whether that type of liability is possible? This makes me wonder...how would they go about removing the aircraft? Do they break it up where it is now and truck it out piece by piece? How long would that normally take? I know this is has come up before but what is the reason that runways in Canada are not grooved? The only thing I can think of is that water will freeze in the gaps and ruin the pavement but I have been to other airports in climates that are similar to Canada's such as BOS, FRA, MUC, etc (I am sure many airports in the northeast as US runway construction is pretty consistent across the country) where they get cold temperatures as well and they all have grooved Runways, proper sloping can deal with water runoff quite effectively. YYZ just re-constructed 05/23 and 06L/24R and I am surprised they haven't grooved them. MEL was referenced in this thread and their runways are grooved but no real freezing temps there. It will probably be suggested in the report but all major Canadian airports need an EMAS system installed and it just needs to get done. It works and I don't think it is all that expensive. Well that is why there needs to be an investigation, in the case of rain and standing water on a runway you use aerodynamic braking to make sure the wheels are on the runway. If you recall AF 358 one of the factors mentioned in the report is that it took 17 seconds for reverse thrust to be engaged from touching down. That wouldn't have prevented that accident but it was noted, but in this case were the spoilers armed and deployed as the plane touched down, was reverse thrust engaged immediately upon touchdown. Those factors also can contribute to an overrun. Anecdotally I've always heard things about snow removal etc but climate doesn't stop airports in the US with similar climates. The article I link below suggests it is just because Nav Canada is cheap. Also, I know that Ottawa has now grooved at least one of their runways. Is the aircraft still there? I am not familiar with YHZ - can they use the other runway or is the airport more or less out of operation? The article doesn't even mention NavCanada so how do you come up with the suggestion that they are cheap? The privatized system they refer to is the airports themselves. Airports are run and managed by individual airport authorities, not NavCanada. Grooving would be done and paid for by these authorities, not NavCanada. I’ve taken a few looks at flightaware since the accident and haven’t seen much effect on operations, though my sample size is obviously limited. Yup both of Ottawa’s main runways are now grooved...the short 04/22 general aviation runway isn’t, but it’s not needed as it’s (as far as I remember) VFR only, and daytime ops only as it’s unlit and the biggest thing I have ever seen using it is a CASA 212...that belonged to Fugro and which crashed at YXE back in 2011. YOW was the first airport in Canada like this and first in Canada to meet the minimum runway safety overrun areas as set out by ICAO. The three Trans States ERJ overruns is what led YOW to lead in this regard.